We've made several sightings of a new turtle on the block: a subadult sporting tags. 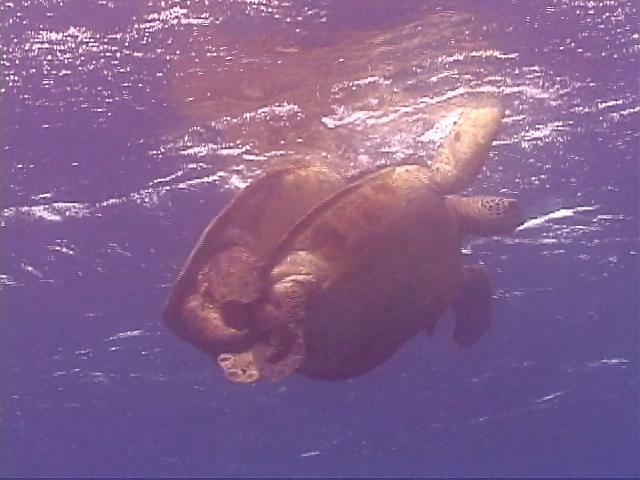 We figured this might be one of the honu tagged from "up the road" near Airport Beach. It took us several attempts, but we finally got close enough to read a tag on the left hind flipper. The tag is coated with algae and the first digit is somewhat obscured. But we could make out J-?28. We reported this to George Balazs of the National Marine Fisheries Service. George took immediate interest but requested we confirm that we did indeed see the letter J. He explained that this would be a turtle tagged at Kiholo Bay on the Big Island of Hawaii. A honu tagged in one island foraging habitat and then sighted at another is "not common." We got lucky and videotaped the tag! We got lucky and videotaped the tag! 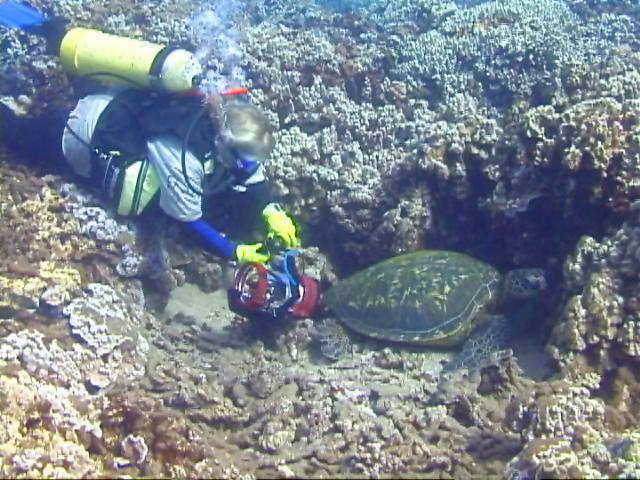 Computer enhancement showed the tag to be J-628, thereby confirming that the turtle had swum to Honokowai, Maui from Kiholo Bay, Hawaii. When George confirmed the turtle's origins, that was our cue to call the voyageur "Kiholo." We also videotaped another tag, left hind flipper 605-C, and reported this to George as well. 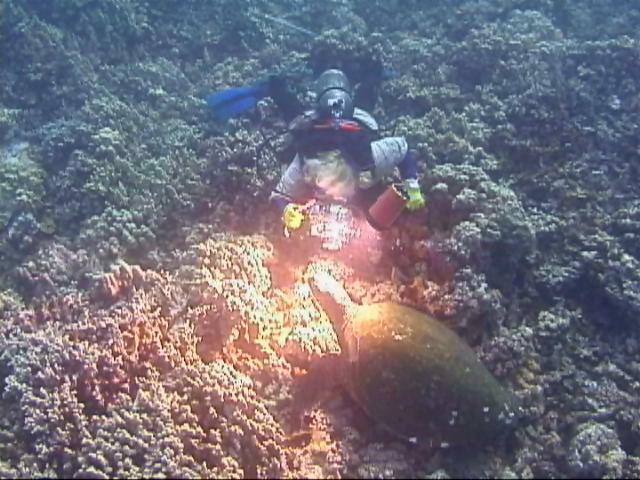 George confirmed this turtle had nested in 1997 at the French Frigate Shoals. What was interesting and new for us however, was 605-C had nested on Tern Island and not at East Island the way the majority of Hawaiian green sea turtles do. In our Summer 1996 summaries we reported on what appeared to be two turtle matings, same male in both instances. Later with the help of sea turtle experts we discovered they weren't true matings at all. In fact, one "coupling" involved two male turtles! There on the surface were two turtles in what appeared to be fond embrace. We were on our way back from a dive and happened to look up. There on the surface were two turtles in what appeared to be fond embrace but we knew better now. Also in "attendance" was Zeus, a large male we've known since 1992 and unmistakeable even from a distance. Two turtles stuck together with one appearing to "referee" warranted closer investigation. The "couple" was actually two males! At this point, no surprise, we realized that the male coupleer was the same male turtle involved in the two previous couplings of 1996! We're not at all sure what to make of that. 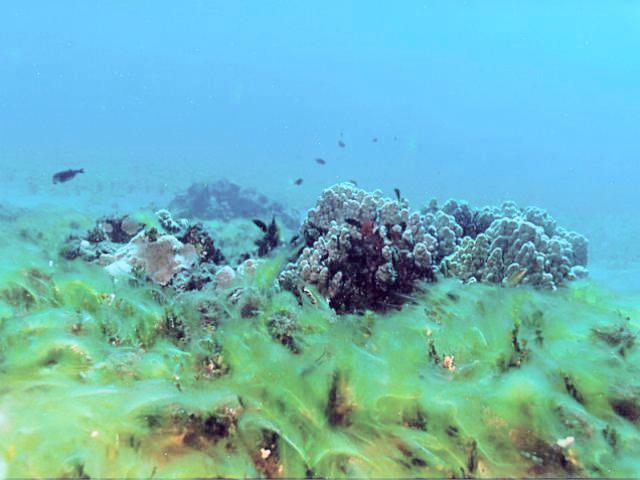 The Cladophora algae is having a great time here at Honokowai. The Cladophora algae is having a great time here at Honokowai, growing profusely and shooting out one to two foot "ropes" of slime. Its greatest concentration is to the north in the shallows. Acres and acres of it. We have confirmed that the honu eat this material, but we have no idea to what extent the turtles have switched from their regular diets to take advantage of all this "wealth". We've tried diving in the early morning to record foraging behaviour, but the turtles will have none of it. Dogs don't like you watching them eat either. 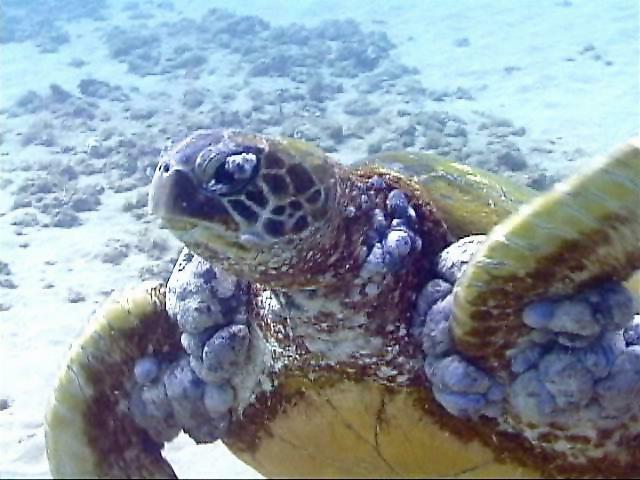 Our primary interest is documenting the expression of fibropapilloma disease in this community of sea turtles. We resighted 1998 Turtle #50 this week and were astounded by her condition. Last summer we detected only four small tumors, one golf ball sized one, and we'd also written "has major dose of clingons" (barnacles). We can't explain the explosion of tumors in the ten/eleven months since we last sighted her. We know we have identified this turtle correctly, but we can't explain the explosion of tumors in the ten/eleven months since we last sighted her. Regardless, for now she represents the worst tumor case we have at Honokowai this summer. We also have good news, however. We continue to record new regession cases. We're fortunate to have turtles who will tolerate close up work, such as this male regression case. He is important in our scheme of things because he provides us with the only regressed mouth tumor we've seen. We're fortunate to have turtles who will tolerate close up work, such as this male regression case.